Yes, the farthest offshore inhabited island. We can see Matinicus Rock (when it's not foggy) from here, but mostly puffins live there and a few Audubon-types during nesting season. We are farther out than oh-so-famous Monhegan. Mt. Desert Rock, depending on how you measure, may be farther out, but nobody lives there since the Coast Guard left a decade or two ago. And Nantucket, measured from Monomoy Point on Cape Cod, isn't really all that far. So here we are. Criehaven is a very special community. We are the farthest offshore inhabited island on the East Coast. 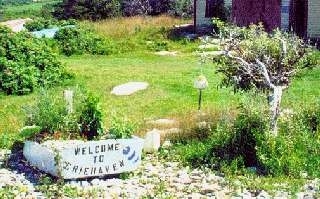 You may not find "Criehaven" on the charts; the mapmakers call us Ragged Island. Look for us a little beyond Matinicus Island, halfway up the Maine Coast. But what makes Criehaven special? Not the miles, but the folks. We have about twenty families, evenly divided between fishing and non-fishing families. The key is the world's finest lobsters. Lobsters like cold and clean water, and we have plenty of that. The water stays cold during the summers, so the lobsters shed later. What do the lobsters have to do with the folks? Well, some come out here to eat them. And rest to catch them. The fishing out here is not in dainty little boats, but real working vessels.